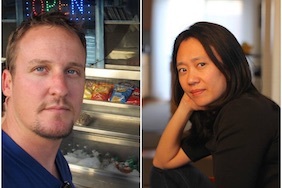 On Thursday night, January 31, the Plan II Honors Program and UT’s New Writers Project will host a public reading for visiting poets Jennifer Chang and Henk Rossouw. This event is free and open to the public, and will take place in the Joynes Reading Room (CRD 007) in the Carothers Building at 2501 Whitis Avenue on the UT campus. The event will start promptly at 7 p.m. No RSVP is required. Jennifer Chang is the author of The History of Anonymity and Some Say the Lark, which was long-listed for the PEN Open Book Award and won the 2018 William Carlos Williams Award. Her poems have appeared in American Poetry Review, The Nation, The New York Times, The New Yorker, Poetry, and A Public Space, and her essays have appeared in Los Angeles Review of Books, New England Review, New Literary History and The Volta. An associate professor of English at George Washington University, she co-chairs the advisory of Kundiman and will be the visiting poet at the University of Houston’s Creative Writing Program this Spring. She lives in Washington, D.C. with her family. Henk Rossouw is from Cape Town, South Africa. His 2018 book-length poem, Xamissa, won the Poets Out Loud Editor’s Prize. Rossouw teaches creative writing and literature at the University of Louisiana at Lafayette. More information about the Spring 2019 Joynes Room Speaker Series can be found here.